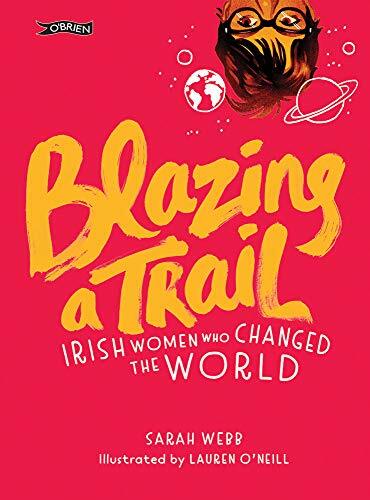 The success of Goodnight Stories for Rebel Girls has prompted a host of books describing the lives and impact of women who, in the words of Ireland’s first female president Mary Robinson, ‘instead of rocking the cradle, rocked the system’ and this is an excellent addition to the canon. It features over two dozen women, from chieftain Granuaile, commanding the seas in the 16th century, to Robinson herself, still fighting today to give everyone in the world an equal say. The list is wonderfully varied – here are suffragists, scientists, artists, aviators, entrepreneurs and sportswomen, and their lives and achievements are energetically though thoughtfully summed up in Sarah Webb’s text, one page per subject. A successful author of fiction, Webb gets the tone spot on, lively and engaging with a real sense of excitement and awe at the way her subjects negotiated the obstacles in their way to pioneer a trail for women. Lauren O’Neill’s accompanying full page illustrations have equal amounts of vigour bringing these women to colourful life. Though the women are all Irish, their adventures take us across the world, from Europe to America and South Africa and there’s a global feel to the book. At the same time, readers will get a strong sense of Ireland, and how its unique history has provided a seedbed for those ready to question and challenge the way things are. I’m particularly intrigued by vet Aleen Cust; by Nellie Cashman, gold prospector and businessman; and by Margaret Bulkley, who lived her life as James Barry in order to study and practice medicine – but everyone will have their own favourites here. A book to inspire all readers.